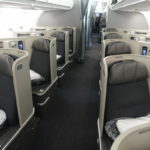 I flew Econony “Minus” on a transcon…. and liked it! After a successful weekend of two bumps netting me $900 in United travel credits, it was finally time to fly home this morning. 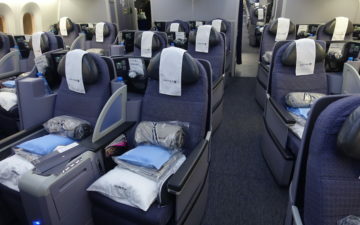 I was on UA914, the domestic 777 from SFO to IAD. When I checked in I was assigned seat 35A, a window seat in coach (not Economy Plus). I figured I’d be able to get something at least a bit better, but oh how wrong I was…. I’ve never flown out of SFO on a Monday morning, and after today I don’t think I ever want to again. The domestic 777 has a capacity of over 300, and there were nearly 100 people on the upgrade waitlist when first class checked-in full. There were nine Global Services that ended up in coach (according to the gate agent). When I got to the gate I asked the gate agent if he could keep my boarding pass and see if he could maybe find me a better seat. He immediately dismissed me, citing the handful of Global Services in coach middle seats. Ouch! Anyway, I really dreaded the flight, because frankly United spoils me so much most of the time, at least as far as personal space goes. As I boarded I could tell it would be a good flight, because the crew was phenomenal. They worked their tails off the whole flight, the captain was awesome (including Channel 9), and frankly Economy “Minus” was kind of cozy…. What I really loved, though, was where I sat in relation to the wing. I don’t remember the last time I sat behind the wing, for better or for worse. But I forgot just how much fun it can be to sit towards the back of the wing and watch the spoilers, flaps, etc. My eyes were glued out the window for the whole departure and approach, which typically isn’t the case when I’m flying up front, because all you can really see are the engines. It’s like I just discovered an old hobby again. And in all fairness the best part about the flight was that it was June 1. That meant the new entertainment was out, so I didn’t have to watch Paul Blart for the ninth time (as much as I would have loved to), or the same episode of 30 Rock. Coach really isn’t that bad! Having no United status, I flew United Coach from LHR to SFO this past March, and other than the guy beside me who smoked in the bathroom, the two guys in the exit row who ignored the FA’s demands to sit during taxi, and the drunk alcoholic who demanded to be served a drink, I can’t complain about my Economy seat on a longhaul United flight! Did you say … cozy? Haha. I don’t recall the last time I flew UA E- (but I have recent and bad memories of E on LH, AA , US). So if I have a credit card that doesn’t swipe properly, I get the food for free? Hmmm. Ben, I have to agree with you. When I was flying with oxygen at the end of last year and the beginning of this year the 2-class 777 was the only plane in UA’s fleet where you could not sit in E+ if you needed oxygen. Since my main route is between SFO-HNL and secondary route SFO-IAD that was my world for about 5 months. You are right, it was cozy. Good info on the credit card swipe. The flight attendant did try to repeatedly “swipe” the card, though. I couldn’t help but smile at your comment regarding menus. I flew coach on NW from NRT-DTW recently, and was pleasantly surprised by having menus available for meal choices. After all, “Korean-style Chicken served on rice with mixed vegetables” and “Teriyaki beef served with…” does give one a better idea of what to expect, than simply being asked “Chicken or Beef?”. I would take a window in E- on the 2 class 777 rather than window in E+ on a 100% full 757 / 320 / 319 anytime. @ ORDnHKG — I *might* agree if it were an international 777, but no way on a domestic 777 for me.